An electronic database is a vast stronghold of binary code, saving and storing millions of bits of information. In the data industry, a cube symbolizes online analytical processing. Structured, electronic queries drill through specific database compartments, mining and extracting requested information. 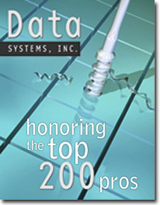 On the Data Systems, Inc. cover, the twisted metal shavings in the 3D illustration represent lines of information bearing code. A fifth, metallic blue ink and a custom gloss coating finish off a unique and memorable cover. Microsoft’s Bryan Watson, General Manager of the Corporate Accounts Business Unit, was photographed on the Renton, Wash. campus for an interview spread in an industry magazine. 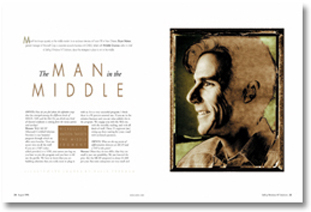 Created with an alternate Polaroid process executed by Davis Freeman, Watson’s image deliberately leads the reader’s eye to the facing page in this spread. 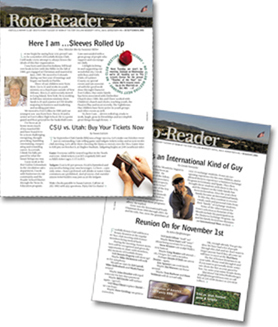 A community level, internal and external information vehicle, the Roto-Reader newsletter is the primary source for educating, stimulating, and inspiring new and long term Rotarians. It’s a way to get the word out: Advertise upcoming events, acknowledge personal and professional milestones, celebrate member accomplishments, and poke fun at colleagues—only in kind spirit, of course. 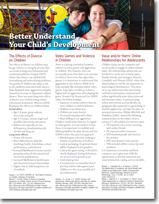 Better understand your child’s development. This clinical take away, quick reference publication arms parents with facts and guidance about how divorce affects children. It also addresses video games and violence in children, and the value and/or harm of online relationships for adolescents. No searches or phone calls needed. It’s a convenient resource for when situations arise away from the clinic. 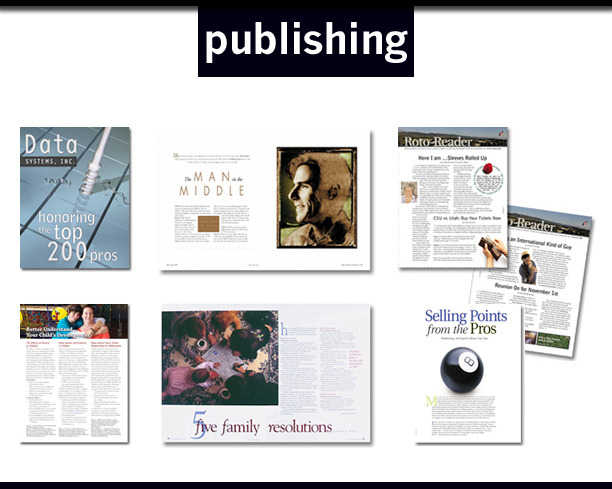 Whether printed, viewed online, or downloaded, it’s information at hand. The tone of domestic tranquility captured in this overhead photo perfectly reflects a family oriented message. 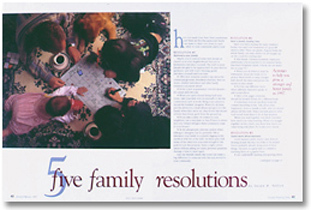 The simple, quiet layout reinforces that message. Billiards is an ancient game. So is business. A multimedia, Business to Business freebie. 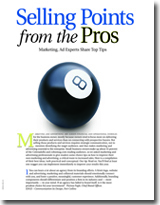 Both a soft touch and a straight shot, it breaks two ways—a marketing tool and tips for increasing business revenue through messaging. Either way, it’s ball in hand, a free shot. You won’t get caught behind the eight ball. Message: Potential clients? Looky-Loos? It doesn’t matter. Click and you connect. Remember, low English draws the cue ball back.